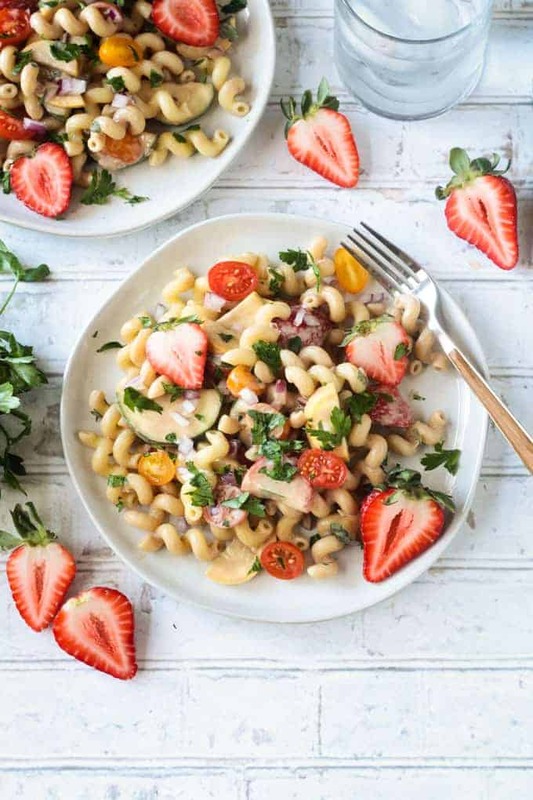 Creamy Balsamic Summer Pasta Salad is the perfect addition to any BBQ, picnic, or potluck. Makes a great light lunch or dinner, too. Dairy Free, Oil Free, Refined Sugar Free, Gluten Free option. 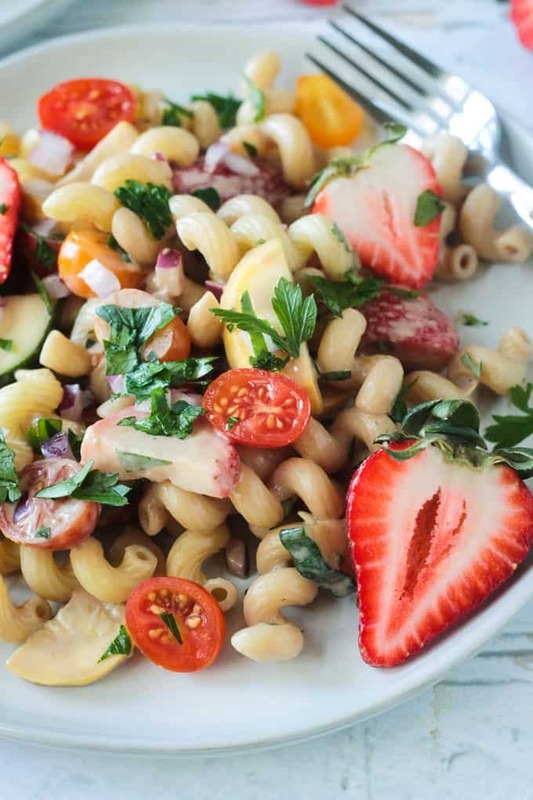 This summer pasta salad recipe is my new BFF. 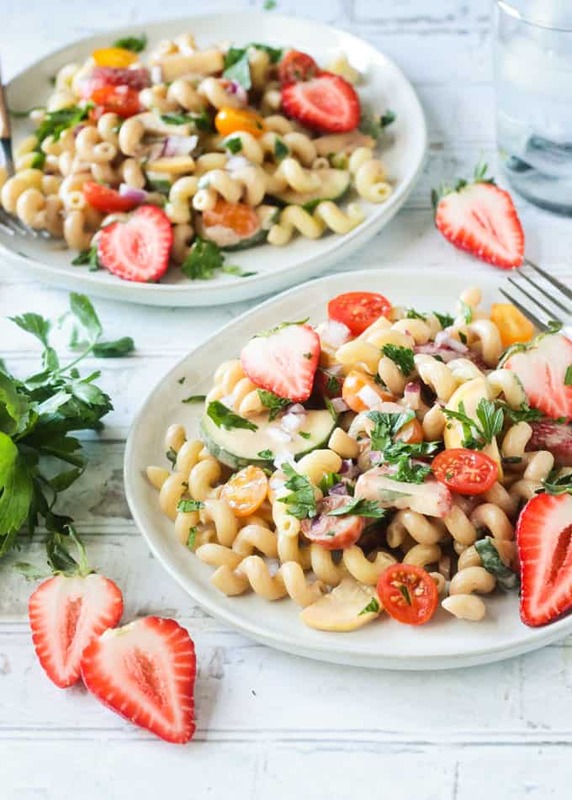 Crunchy raw veggies, sweet strawberries, juicy tomatoes, fresh herbs, and curly pasta all tossed with a creamy balsamic dressing. It’s the perfect sweet and tangy flavor combo. It’s the perfect creamy, tender, and crisp texture. Bonus: it’s beautiful to look at, too! 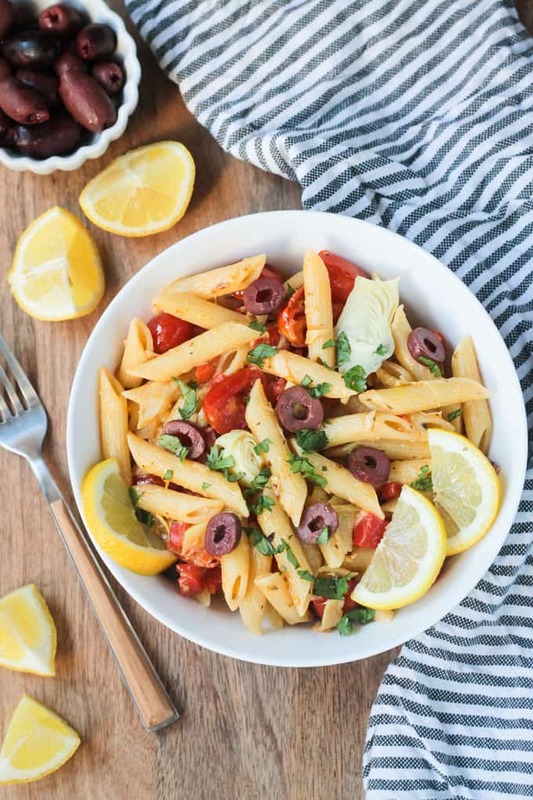 Delight all the senses and please your whole family with this quick and easy Summer Pasta Salad! I get so excited about this time of year – ALL the summer veggies! We haven’t planted our backyard garden yet because it pretty much went from overnight frost to rain every weekend. It’s looking like some nice weather coming up, though, so fingers crossed we will get it done soon. Zucchini and yellow summer squash are some of my favorite vegetables to grow. They are super easy to tend to and one little plant produces an abundant harvest that continues all season long. This article has some great tips for growing zucchini if you’re interested. All types of summer squash are high in vitamin A, vitamin C, potassium, and fiber. They are lower in natural sugars and starches than their winter counterparts. They boast many antioxidants and are very low calorie due to their high water content – hello hydration! 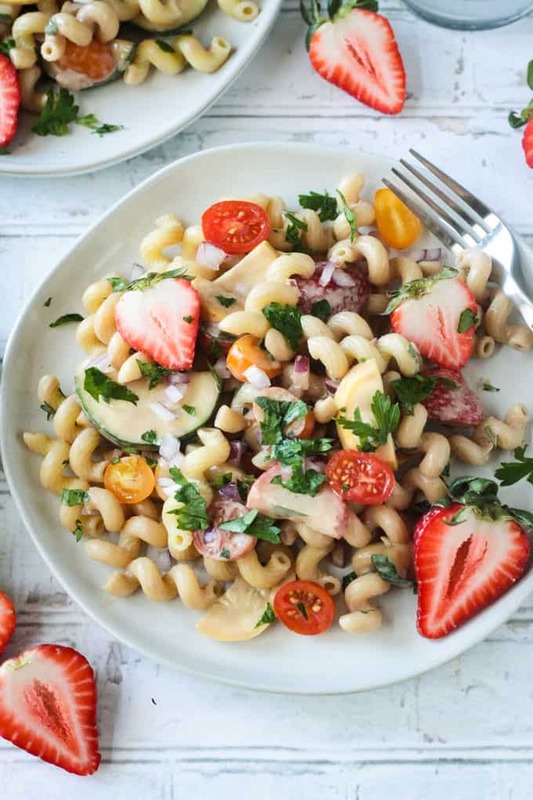 How do you make a pasta salad creamy without mayo? 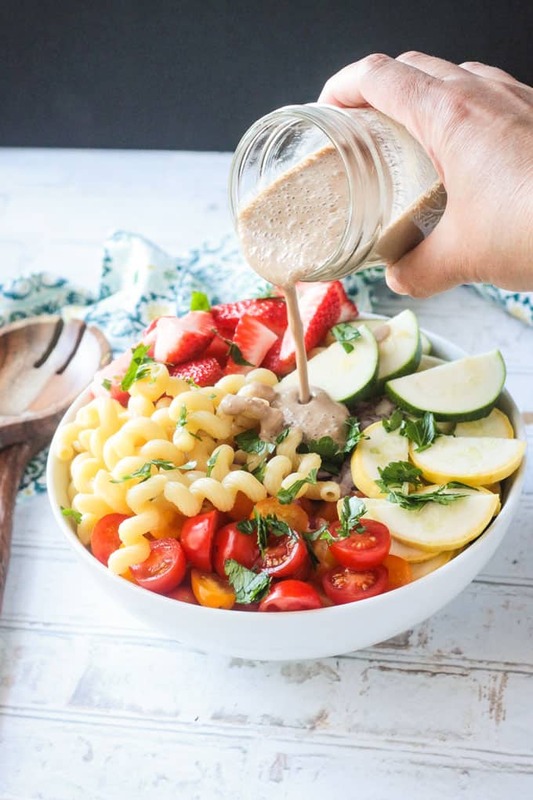 With this creamy balsamic pasta salad dressing! No mayo, no yogurt, no oil, no kidding! Just sweet and tangy flavor that complements the salad ingredients perfectly. Just like in my popular Creamy Cumin Ranch Dressing and reader fave Butternut Mac Sauce, raw cashews are the answer to oil-free creaminess. You can whiz it up in a high speed blender (affiliate link -> I LOVE my Vitamix) in under a minute. If you don’t have a high speed blender, I suggest you soak your cashews in warm water for an hour or two (or overnight) first. Is there anything better than a freshly picked summer strawberry? 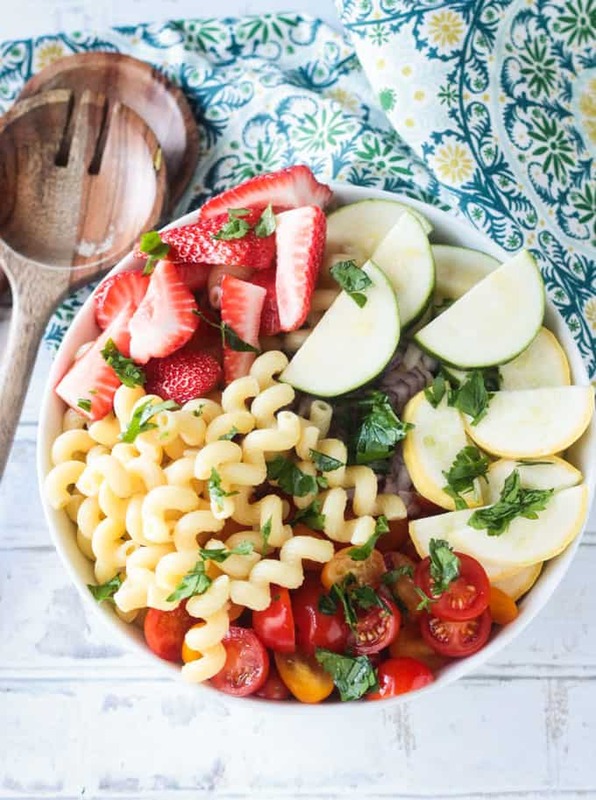 But, strawberries in a pasta salad with vegetables? Heck, yes! These summer goodies all pair so nicely together. The strawberries bring a lovely sweetness and burst with fresh flavor. So, we talked about the zucchini and summer squash, the juicy sweet strawberries, and the creamy dreamy balsamic dressing. 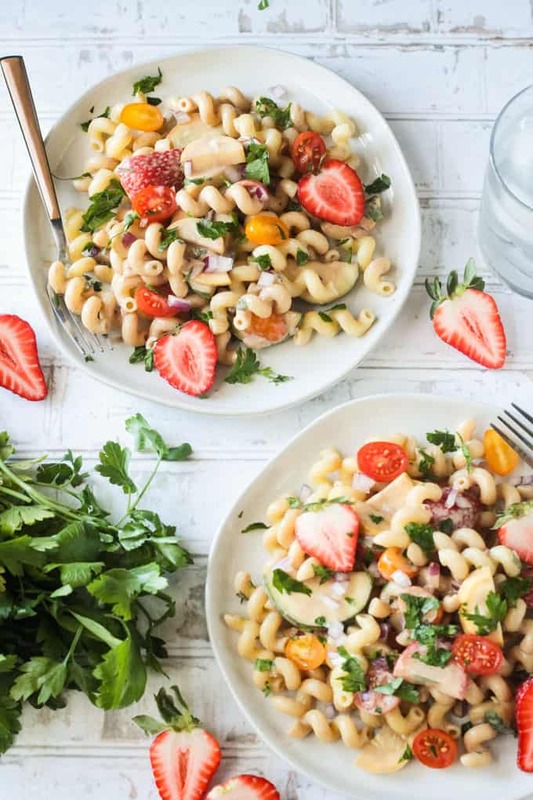 What else is in this Summer Pasta Salad? Halved grape tomatoes, diced red onion, and chopped fresh parsley. Oh, and of course, the pasta! You can change up the shape of your noodles if you like. Farfalle, penne, rotini, even medium size shells would all work well. Just don’t leave out any of the ingredients – they all mingle together for the perfect balance of flavors and textures. 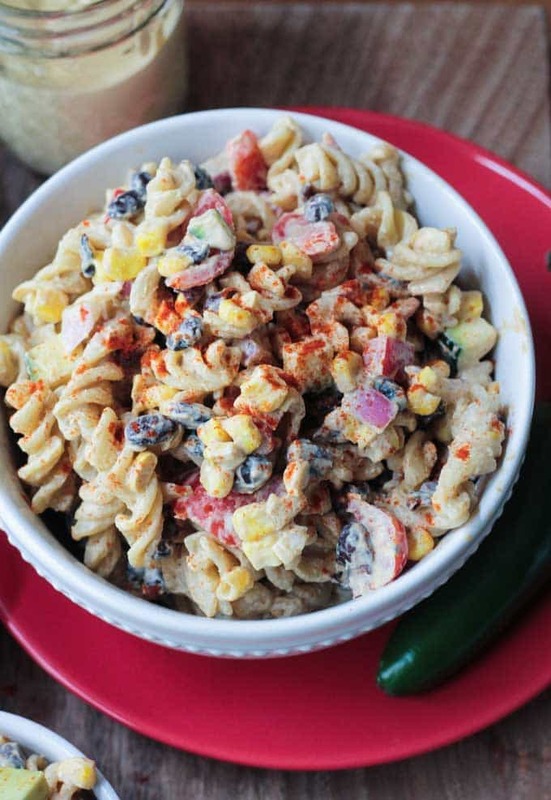 I’m sure you all know that cold pasta salad is a requirement for backyard BBQ’s. A bonus of this dish being dairy/mayo free is that won’t go rancid sitting out for awhile. Pack it up for any picnic or potluck adventure…or even simply in your lunchbox during the week. 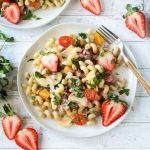 As written, this Summer Pasta Salad recipe will serve 8-10 as a side dish, but could easily be doubled (or tripled) to feed a larger crowd. It’s a simple recipe that’s quick and easy to make, but feel free to make it ahead of time if you need. Store it in the fridge and bring it out when you’re ready to eat. I like to top it off with an extra drizzle of balsamic vinegar just before serving. 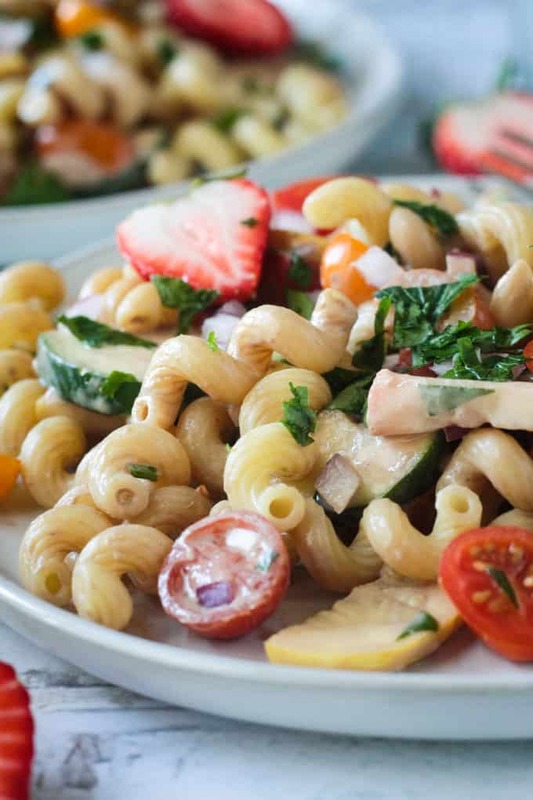 I hope you love this Summer Pasta Salad recipe as much as do. If you try it, please come back and leave me a comment below with your feedback and star rating. You can also find me on social media. Be sure to tag @veggie_inspired and #veggieinspired so I’m sure to see it. Enjoy! Cook the pasta according to package directions. Drain and set aside to cool. Add the chopped veggies, parsley, and strawberries to a large mixing bowl. When the pasta has cooled, add it to the vegetable mixture. Sprinkle with 1/2 tsp salt and pinch of black pepper. Toss to combine evenly. Pour the Creamy Balsamic Dressing (instructions follow) over the pasta salad and toss well to combine. Place all ingredients (starting with 3 tbsp of balsamic vinegar and 1/4 cup water) into a high speed blender and purée until smooth. Add more water to thin if needed for desired consistency. Taste and add another 1 tbsp of balsamic vinegar if needed. (Add the water before tasting for additional need of vinegar because the water will dilute the flavor. Also, keep in the mind that once added to the pasta and veggies, the flavor will be diluted again, so you want the dressing pretty strong!). This recipe serves 8-10 as a side dish. Nutrition facts calculated based on 8 servings. Made this salad for my 2 year old son’s birthday party and it was a huge hit. I made it the day before, doubled the dressing and put half on when I made it and the rest when I served it the next day. I’m so glad everyone loved it! Thank you, Jessica! And Happy Birthday to your son! Can this be made the night before? Will it keep? Looks delicious and I can’t wait to give it a try. THanks! Hi, Teri. Yes, you can make it a day in advance. You might want to keep the dressing separate and mix it right before serving. Enjoy! The strawberries are such an unexpected addition to this salad but I bet they are just amazing with the other raw veggies. Something I definitely wouldn’t have thought of but need to try! Thanks, Hayley! They add a bit of natural sweetness and complement the other flavors really well. Love the colours in this salad, and all the healthy vegetables! This recipe is an excellent way to serve up strawberries as well, we always have more of them than we know what to with this time of year. Thanks, Courtney! I love adding fresh summer fruits to otherwise savory dishes! I loooove pasta salad. (Maybe because I love pasta? haha) this is perfect for a picnic! Pasta is always a win, right?! Thanks, Liz! It looks so summery and refreshing. I love all the ingredients in this salad. I know what I’m making for my next BBQ party. We make this for every BBQ and it always goes down well. Such a colourful salad. Oh, that looks so delicious! I love that you use the cashews to make it creamy! So much healthier! I also love that you added the strawberries! Just perfect for a summer salad! No. 2 in the recipe should read: combine the veggies, etc. then add the drain cooled pasta. 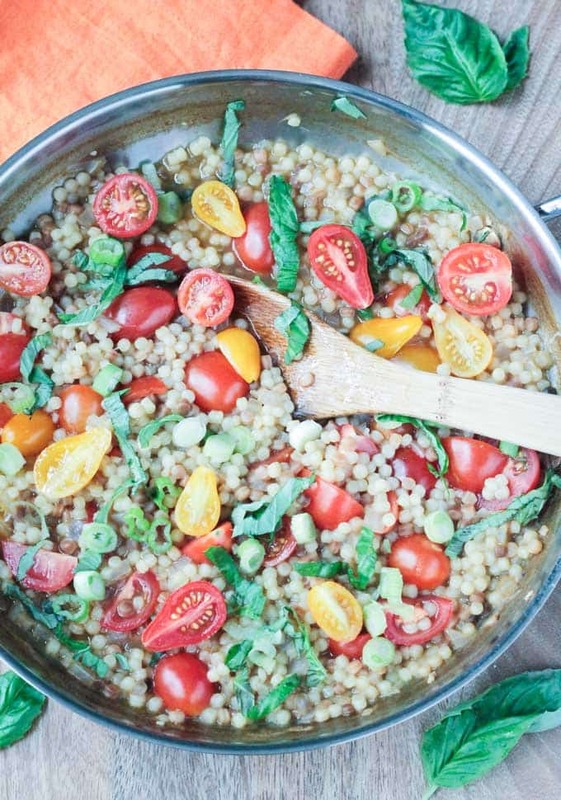 This looks like an easy summer salad and will give it a try soon. Thanks, Elizabeth. All of the directions are clearly stated. Enjoy!